Now that we’re well acquainted with the role of antioxidants in health, along comes another process that is as important if not more important than oxidation. It ’ s Inflammation. Most of us are familiar with our body ’ s response to infection or injury. That ’ s acute inflammation and it ’ s characterized by the redness, heat, swelling, and pain that is the normal response of the immune system. Immune cells collect at the site so that they can overwhelm and dispose of infectious organisms or debris from injury. Thus healing takes place. But there ’ s another kind of inflammation — low-grade, chronic, and “systemic.” Chronic inflammation is linked to the most feared diseases of aging like cancer, heart disease, Alzheimer ’ s, diabetes and arthritis. And unlike acute inflammation, chronic inflammation may not have any symptoms. Examples of conditions that cause chronic inflammation include gum disease, diabetes, obesity, high blood pressure, cholesterol build up in arteries, smoking, inactivity and stress. Inflammation also damages nerve cells in the brains of Alzheimer’s victims and contributes to the proliferation of abnormal cells and facilitates their transformation into cancer. Protection from inflammation by compounds in the diet is very complex and not well understood. Some of the mechanisms that have been identified include interfering with the development of inflammatory compounds at the genetic level. Indeed, Jim Joseph Ph.D. has determined that compounds in blueberries have just that effect in the brain in animal models. The typical western diet, high in refined carbohydrates, fats, sugars and calories actually contributes to inflammation while a diet higher in fruits, vegetables, whole grains and omega 3 fatty acids (salmon etc.) is anti-inflammatory. Vitamins, minerals, as well as plant compounds have both antioxidant as well as anti-inflammatory properties. 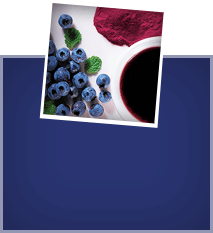 Wild Blueberries contain flavonoids such as anthocyanins, flavonols, and proanthocyanidins that have been shown to contribute to protective effects. 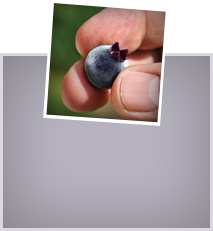 Now we know that Wild Blueberries have benefits beyond their high antioxidant properties. Fruits and vegetables are the cornerstone of healthy eating as they are for an “Anti-inflammatory diet.” And blueberries, particularly Wild Blueberries are leaders in the fruit category.